First Line: Teddy, you would've been proud of me. Em Moore is the writing half of the celebrity biography team of T.E. Blakemore. Em is brilliant at writing but shy to the point of being agoraphobic. She has always relied on her partner Teddy Blake, who is a wizard at interviewing people and being the public "face" of the team. When Teddy is killed in an automobile accident, Em is devastated, and she has to fight to convince the publisher that she's capable of finishing the interviews-- and the book-- which is an "autobiography" of famed film director Garrett Malcolm. Staying in a small cottage on the Malcolm estate, Em slowly becomes accustomed to conducting the much-needed interviews-- and it's not long before she begins to hear the faint rattling of skeletons in the Malcolm closet. But Em is still on shaky emotional ground. When the police begin looking into the accident that caused her beloved Teddy's death, will she be able to handle it? The Perfect Ghost is my first encounter with Linda Barnes' writing. I have yet to sample any of her series books featuring Carlotta Carlyle. My reactions to this book were mixed. I like Barnes' style of writing. She can paint a scene and bring it to life vividly. I also enjoyed the voice of Em Moore and the careful building of her character. I identified her very early on as an unreliable narrator, which spoiled the surprise that the ending of the book depends on for almost all its success. If that one thing hadn't happened, I think I would have enjoyed this book a great deal more. 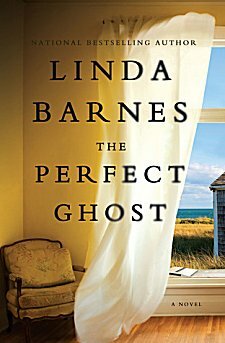 However, with her writing style and powers of characterization, I know I will be reading more of Linda Barnes' books. Cathy - Isn't it interesting how one incident, character, etc. can be enough to 'stop' the reader. Erin's character really does sound interesting and just from your description it sounds as though she evolves as the book goes on. Ya gotta like that in a novel. Yes, you do. However, it's a bit risky to hinge the success of your book on a surprise ending. Something different and it sounds interesting. Maybe I'll try it. Barnes certainly had an interesting premise.